IMCDb.org: 1978 Scania BF 86 Skandia in "Tre kronor, 1994-1999"
But is it a truck or a converted bus ? It was most definitely built on a chassis of a bus or coach, and hence it's (should be) a BF 86 (the last F means engine at front). There were two competitive coach builders that look virtualy the same, both building home removal buses, namely Karlaverken in Laholm and Skandiakarosser also in Laholm. But as Karlaverken, according to http://www.pvchassi.com/tillverkare/karlaverken.html stopped in 1969, and the 86 roughly was made the years 1978-82, I believe the body was made by Skandia. Skandia has survived and is today called Helmark. 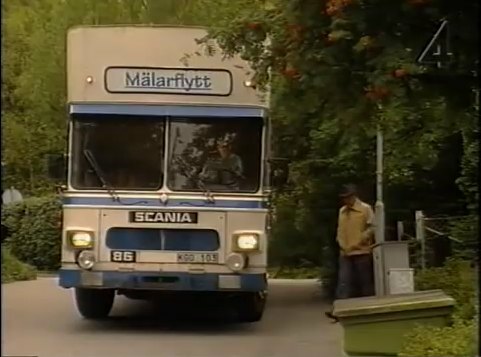 Therefore I believe this is a 1978+ Scania BF 86 coach built by Skandia. The concept is sometimes called "Möbelbuss" (ENG: Furniture bus) or "Flyttbuss" (ENG: Home removal bus).